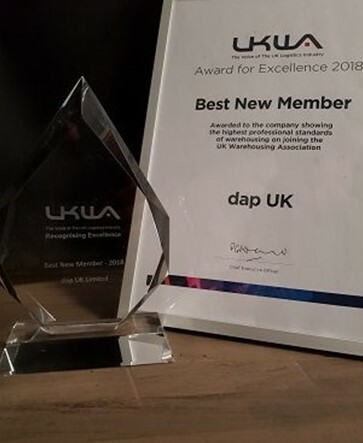 At the Dorchester Hotel in London on 4th July 2018, dap UK, member of ALN representing United Kingdom, was awarded the ‘Best New Member 2018’ accolade by the United Kingdom Warehouse Association. This corporate award is given to the company showing the highest professional standards of warehousing on joining UKWA. Accepting the award on behalf of the Company, CEO and owner Clive Julian commented: “It is testament to the quality and professionalism of the team at dap UK that we should gain this recognition from the logistics industry’s leading trade organisation in our first year of warehouse operation.